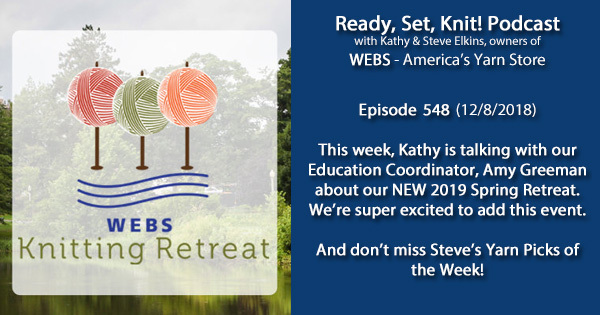 This week, Kathy is talking with our Education Manager, Amy Greeman about our 2019 Spring Retreat! A brand new event for us. Teachers include Patty Lyons, Nicky Epstein, Susan B. Anderson, Michelle Hunter (KnitPurlHunter), Julia Farwell-Clay, Fiona Ellis. You don’t want to miss out on this one! For more information, check out the info on our site here. Our Holiday 2018 catalog is LIVE! Click HERE to check it out! WEBS is open on Sundays for the holiday season this year! We’ll be here from 12-5 for all of your holiday shopping needs! Our last Sunday opening is Sunday, December 23rd, so if you’re going to be in Northampton, don’t forget to stop by and say hi! Do you have a crafting resolution for 2018? We sure do! Tag your posts #WEBSfiberfollowthrough for a chance to be featured! 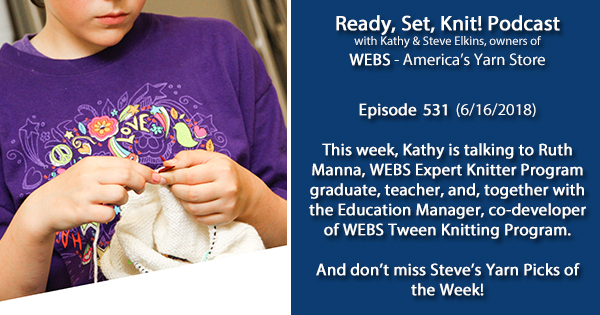 Today, Kathy talks with Ruth Manna, a teacher at WEBS who will be teaching a Kids Knitting Camp our store. You can check out Section 1 here and Section 2 here. She and Kathy discuss the differences between teaching adults and children. Sad news for the yarn industry, Classic Elite Yarns is closing its doors. We were very sad to hear the news and wish everyone involved the best. Mango Moon will also be closing. The I-91 Shop Hop is coming soon! Don’t miss this fun shopping event. Looking for something to do this summer? Check out the full list of WEBS class offerings over here! Registration for the WEBS retreat is full and we are soooo excited! To join the waitlist, click here! 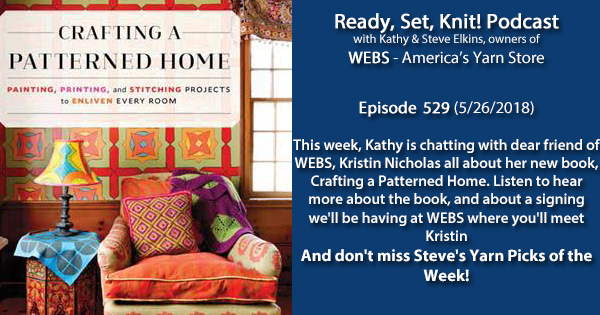 This week, Kathy is talking with one of our favorite WEBS friends – Kristin Nicholas! Kristin has just published a stunning new book, Crafting a Patterned Home. In this new book, you’ll get a ton of inspiration for combining pattern, texture, and color when decorating your home – or putting together a craft project. Best of all, the photos for the book were shot at Kristin’s house in Leyden, MA – a short distance from WEBS. She even hosts crafting retreats at her home! Kristin will be at WEBS on Saturday, June 2nd from 2-4. Sign up here for this free event! Cascade Yarns Pacific – May sale! Lana Grossa Alta Moda Alpaca – May sale! Sublime Baby Cashmere Merino Silk DK Prints – May sale! 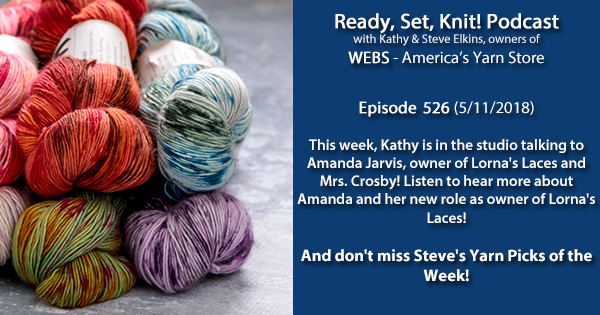 This week, Kathy is chatting with an in-studio guest: Amanda Jarvis, the new owner of Lorna’s Laces and Mrs Crosby! Lorna’s Laces is one of our absolute favorite yarn brands here at WEBS, and Mrs Crosby’s Reticule is featured in Twist Collective’s May issue. Listen to hear more about Amanda’s journey with fiber arts and her new role as owner of Lorna’s Laces! Trendsetter Phoenix Print – closeout! Dale Garn Daletta – closeout! Cascade Ultra Pima– on sale in May! 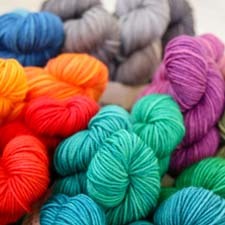 Scheepjes Whirl– on sale in May! Scheepjes Secret Garden– on sale in May! Planning a trip to WEBS? Come in between now and May 18th to participate in the WEBS Super Summer Giveaway! Shop in the store, and when you check out, you’ll receive a sealed envelope that contains a secret prize – don’t open it! Bring it back to WEBS between June 1st and June 30th and we’ll open it for you! Your envelope could contain WEBS goodies including a $250 gift card!! The best part? Every envelope is a winner – every single one! Don’t forget to come back! Our favorite event of the year is coming soon!!! The WEBS Tent Sale is happening Saturday and Sunday May 19th and 20th! Protip: Come on Saturday so you can visit our Fleece Market! 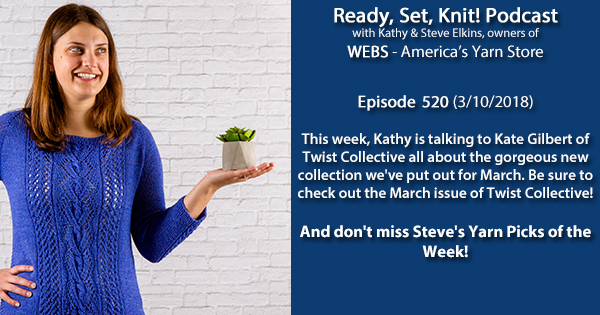 This week, Kathy is talking with our very own Kate Gilbert of Twist Collective! Twist Collective just released released their March issue, full of gorgeous sweaters and accessories to help you ring in spring! Each pattern has been kitted, so you can get the yarn and the pattern in one convenient stop, but if you’d rather buy them separately, you’re more than welcome! To check out the full issue, head on over to Twist Collective’s site! What’s your favorite project from the March issue? The WEBS Rhinebeck Sweater KAL is back and will be starting up soon! To knit a sweater to wear to Rhinebeck in a supportive atmosphere, consider joining us! The cost includes 6 meetups (snacks included!) AND your ticket on the WEBS bust to Rhinebeck! We can’t wait!! This week, we have two guests! Mary Scott Huff is with us to talk about her new book, The Mitten Handbook. In it, she includes several patterns as well as tips and tricks and suggestions to make the perfect mittens! Mary will be at WEBS at the end of March to teach classes in stranded colorwork! You can choose from 2 Strings = Not Scary, where you’ll learn the basics of holding two strands of yarn at a time, Start to Finish, a great class for planning a project from top to bottom, and Sassy Selbuvottr Mittens, where you’ll learn all about the Norwegian tradition of colorful stranded colorwork mittens. We also have Cynthia Yanok chatting with Kathy about an amazing opportunity to take a European knitting cruise along the Danube! It’s the perfect vacation for knitters and non-knitters alike! For more information, click the link here. 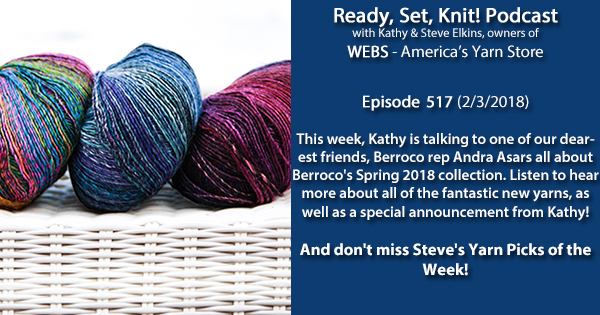 Andra Asars will be at WEBS on Friday, March 9th, and Sunday, March 10th hosting a Berroco spring preview party form 12-4! We’ll have light refreshments, door prizes, and we ask that you please dress in order to try on garments! The event is free, but you’ll need to register! 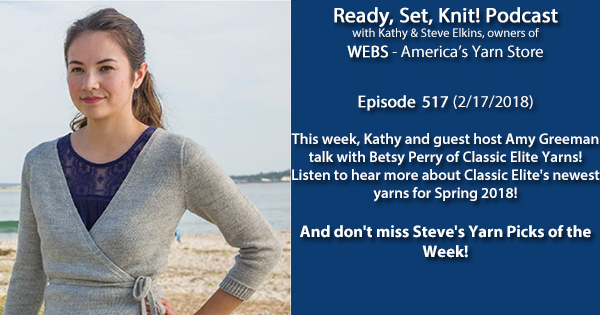 This week, Kathy is chatting with Betsy Perry of Classic Elite Yarns! Betsy is here to share Classic Elite’s newest offerings for spring, Juna and Gigi! Juna is a scrumptious blend of Merino wool and alpaca, while Gigi is the perfect summer yarn: breathable cotton and silk with a hint of stretch polyester. Click the links below to check out each yarn and the beautiful pattern support that goes with them! WEBs will be at Stitches West in San Jose, California from February 22nd through 25th! Click here to find out which booths we’ll be at! 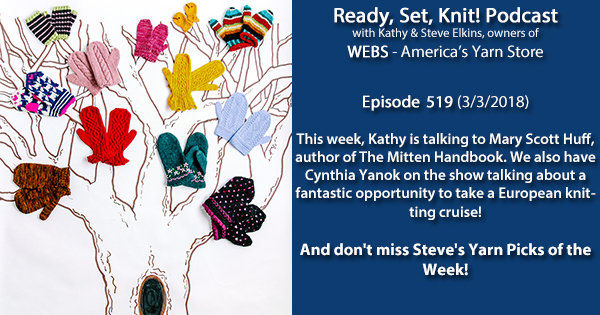 This week, Kathy is talking to one of our favorite Ready, Set, Knit! guests, Andra Asars of Berroco! Andra is here with a fantastic collection for Spring 2018, as well as beautiful new designs from the creative minds over at Berroco. One of our favorites is Gelato knit in Medina, a stunning self-striping cotton blend. Gelato uses self-striping yarn to its full advantage, as it’s worked in two different directions. Berroco also has two lighter weight versions of some of our favorites: Millefiori and Ultra Wool! Click the links below to check out each yarn individually! Sirdar Click Chunky with Wool – Closeout! Sirdar Snuggly Snowflake Chunky – Closeout! Hayfield Siesta DK – Closeout! WEBS will be holding our 3rd Annual Knitting Retreat here in Western Massachusetts this September. Registration opens at noon on Thursday, February 15th, and class registration for attendees who have already registered for the retreat will open on Monday, February 26th! Check here for more details in the coming days! Come and join us for the annual Big Game Day Escape at WEBS tomorrow, Sunday, February 4th from 12-4! Bring your knitting, crocheting, spinning wheel, or even your rigid heddle loom! We’ll have plenty of snacks and prizes, as well as a yarn tasting from Lana Grossa – and it’s totally free! Just sign up here to let us know you’re coming! 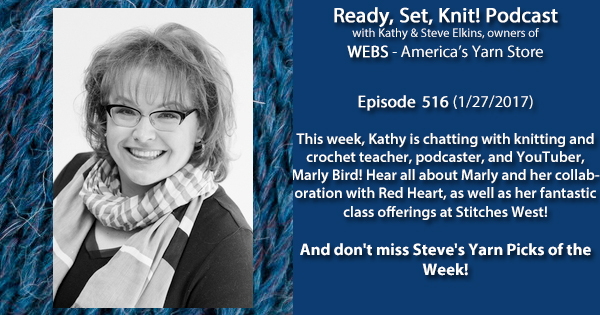 This week, Kathy is talking with Marly Bird! Marly is a knitting and crochet teacher, YouTuber and hosts her own podcast, YarnThing! Listen to hear more about Marly, her collaboration with Red Heart, and don’t forget to sign up for her classes at Stitches West! For a list of Marly Bird classes at Stitches West, click here! We’re excited to welcome Julie Turjoman as our new Design Manager. We’re thrilled to have her on the team and can’t wait to share new designs with you! Come and join us for the annual Big Game Day Escape at WEBS on Sunday, February 4th from 12-4! Bring your knitting, crocheting, spinning wheel, or even your rigid heddle loom! We’ll have plenty of snacks and prizes, as well as a yarn tasting from Lana Grossa – and it’s totally free! Just sign up here to let us know you’re coming! 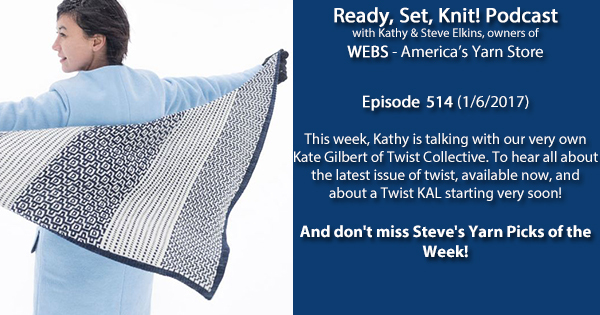 This week, Kathy chats with Kate Gilbert about the new issue of Twist Collective and the Framework Video KAL. If you haven’t checked it out yet, make sure you take a look at the latest issue of Twist Collective here. You can purchase kits with the yarn and pattern at yarn.com!